“We are back, Sony Ericsson is back and bringing back innovation” promised Sony Ericsson’s UK MD, Nathan Vautier at a briefing to unveil the new Xperia Arc handset. And while for so long we’ve been used to grand promises from the joint venture, the Sony Ericsson Xperia Arc looks, on paper at least, to have a shot at finally living up to the vibrant billing its been given. Running on Android 2.3, the first box is already ticked for the new phone: using the latest version of the Google OS, something SE has failed to do spectacularly on numerous occasions with the likes of the X10 and X8 in 2010. The design is very sleek too – the curved back sloping attractively inwards rather than using the bulbous human curvature design of last year, and sits very nicely in the hand with a width of just 8.7mm at the middle. The front keys on the phone are thankfully physical, making it easier to hit them without looking, and mixing the design of the original X10 and the Vivaz, again adding to the aesthetic. Despite the presence of video calling functionality in Google’s Android 2.3, the Xperia Arc is devoid of a video calling function – we can’t say we’re upset, because it’s only in tablets that we think we’ll see the need for proper video calling. One of the problems we found with the Sony Ericsson Xperia Arc was the lock key. It’s accessed using the power button on the top left-hand edge of the phone and isn’t the easiest to locate and hit without looking – leagues behind the simplicity of the Google Nexus S and iPhone 4. The HDMI-out port is located on the top of the phone too, and while we didn’t get the chance to test out the functionality, we’re promised by Sony Ericsson that HDMI-mirroring will be possible, meaning you can display anything from multimedia content to websites via your big screen. Sony Ericsson will be bundling a mini-HDMI lead in with each Xperia Arc, meaning it will be easy to perform the connection, although DLNA is also offered if you don’t want to have to sit close to the monitor to show off your holiday snaps. Another feature from Sony Ericsson is noise cancelling – a small secondary microphone is dotted on the back near the 8MP camera with single LED flash, which should pick up background noise quite nicely. Despite the Arc’s slender frame, the 3.5mm headphone hack seems to fit quite nicely at the top right hand corner of the device; whether this will get in the way – as side-on ports often do – remains to be seen in our full Sony Ericsson Xperia Arc review. The only other bit of handset furniture is the side micro-USB slot on the right-hand side (which we’re assured will be covered at final release) and the up and down keys – pretty standard stuff. Oh, there’s a little notification light to alert you to messages and battery charging – we’re fans of its presence, but its positioning on the side of the phone seems a little suspect for easy viewing. The main interface of the phone is exactly as Sony Ericsson promised: a version of the Timescape UI (with a small dock of icons) and standard Android Home screens. Where the first Xperia X10 came out with a stupidly heavy UI on top, this feels very much scaled back, and the ease with which you can drag and drop new icons on the bottom dock shows how much better the Xperia Arc is than its predecessors in terms of interface. Browsing around was snappy and easy – no lag between the screens, which we’ll put down to the addition of Android Gingerbread on the handset, as it responds in a very similar fashion to the Google Nexus S.
The menu system looks a little simplistic at first glance, but there is a little surprise: you can edit it to your own ordered preference, or have the phone do it for you over a number of categories, making it less stock Android and more LG Optimus 2X-like. The other little feature is the overview mode – pinch in as you would on other top-end Android phones and you’ll get instant access not to Home screens, but the widgets used therein. It’s a novel feature, and one we feel we could grow to like, as these are the things you often have to place far away from the default screen to fit in correctly. The camera on the Sony Ericsson Xperia Arc is another headline grabber – using Exmor R technology will offer better response in low light situations, although in our neon-lit room it was hard to test that. The shutter speed seemed pretty quick in our snap tests, although we’ll need to give it a good range of views to have a go on before we make any quick judgements, as all that extra tech could delay snapping ability quite easily. The internet browser on the Sony Ericsson Xperia Arc is definitely a step up from what we’ve seen before from the alliance, but it merely brings it up to speed with the rest of the Android gang rather than racing ahead. For instance, we’re relieved to see multi-touch on board, and while pinching and zooming sees the letters all rejig, you need to give them another tap to force them to fit to the screen. But at least they stay in the right formation after that, and it seems the addition of Flash video doesn’t slow things down either – hopefully that next-gen Qualcomm chip at the heart of things can keep matters ticking along nicely. The keyboard wasn’t any great shakes, if we’re honest; the default Android version on the Nexus S is way better and more accurate, and we couldn’t access it on the Xperia Arc. While the offering on board is OK, it’s nothing special and a rather large amount of accuracy could be found, despite our best efforts at quick typing. We’re sure you can get used to it, but the auto-correct doesn’t seem as intuitive as its rivals. Good news again – Exchange is on board by default, so no need to faff about with a separate Moxier Mail application for contacts or messages. Finally we tested out the media player – well, to be exact, the movie player. The Mediascape application has been replaced with a widget, which still has the infinity icon to find more information on certain songs, but is now no longer a maze of functionality as it was previously. Without headphones we couldn’t properly test the music, but out the stereo speakers it was strong and powerful – enough to annoy the hell out of all other commuters if that’s your thing. But onto the video player – it’s sensational. Definitely up there with the best in the industry, such as the Samsung Galaxy S, the Sony Ericsson Xperia Arc looks like one of the top video-playing phones around. The only thing we had an issue was the colours looked a little washed out at times, but SE promises this is still something that needs to be optimised to work correctly before launch. We’re trying to find the full list of codecs supported – if this can manage DivX we could be onto a real winner. The motion was smooth, the resolution pin sharp – in short, everything worked as we’d hope it would. The only problem we can see is storage: only 8GB in the box and less than 500MB internal? That’s going to fill up quickly, we can see. 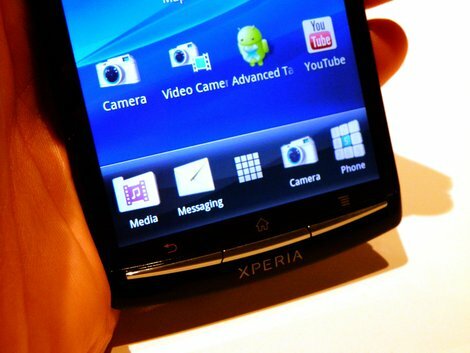 Overall impressions of the Sony Ericsson Xperia Arc? Impressed, although with a tinge of trepidation. We’ve been burned before; Sony Ericsson has promised the world and then failed to deliver timely updates or offered us rotten battery life. But the style and performance we saw in this early hands on was enough to fill us with hope – the sheer fact Sony Ericsson was willing to show it this far away from launch means a step forward has definitely been taken, as at the same point in its lifetime the X10 was a woeful mess at a demonstration. We’ll reserve judgement until our full Sony Ericsson Xperia Arc review comes out in the near future, but until then we’ll hope SE has finally worked out that good phones make for happier consumers when the UK release date of March 2011 rolls around.